The Ad Impact Awards are often closely fought and the July round proved no exception, with both Steinlager Pure and V performing above the norms as impactful TV ads. But Taika Waititi’s comedic effort in DDB’s Steinlager Pure ‘When things are this good’ TVC was too strong, pipping Colenso BBDO’s V Motion Project. As you wind down and get set for your two days off ahead of the next week, spare a thought for Colenso BBDO’s copywriter Simon Vicars. The poor bloke was sitting in an airport lounge when we called him, getting ready to wing his way to Fiji for a week’s “work”. Then we had to break the news Colenso BBDO had won the May round of The Glossies with 34 percent of the votes for its ‘Idiot’ print ad in NZ Rugby World. 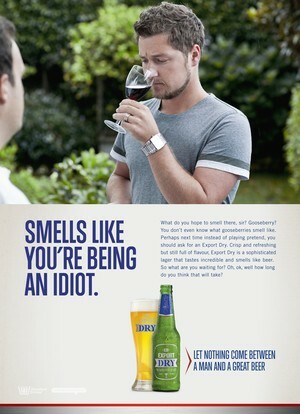 ‘Idiot’, part of DB Export Dry’s ‘The Wine is Over’ campaign, put itself a fare distance ahead of its closest rivals. Earlier this week we pointed out a billboard for the new True Blood series on Prime. And the folks at DraftFCB and Phantom have sent us even more billboard fodder confirming the adult-orientated humour of the campaign. Sally Willis, Prime’s account director at DraftFCB, says the aim was to shake any teenage preconceptions people held about the show, differentiating it instead as a “raunchy, intense and gritty raw drama”. And as these latest examples from the campaign show, there’s more raunchy humour than you could stab a stake at. If a sign of a successful campaign is the courting of controversy, then Telecom and partners in crime Saatchi & Saatchi are well placed. But the wealth of opinions that have gushed forth following the unveiling of the ‘Abstain for the All Blacks’ campaign seems to have those involved retreating for shelter. Meanwhile others have offered alternative campaigns of a similar vein. When Shell’s fuel business was sold to the New Zealand Superannuation Fund and Kiwi infrastructure company Infratil in April last year (for a cool $695 million, we might add)—both of which are owned and operated by Greenstone Energy—the wheels were set in motion to replace the brand with something Greenstone Energy describes as “entirely Kiwi”. $35 million later, the new petrol stations, called Z Energy, are being unveiled across the country as part of a complete brand overhaul. And, coupled with extensive market research, the finished product comes courtesy of a number of industry players, including Cato Partners and Assignment Group. Here at StopPress we get our fair share of disgruntled murmurings about, well, lots of things really. Just recently someone approached us about some alleged dodgy online advertising practices and our ears pricked up. The source wished to remain anonymous but claims online media agencies are placing ads on websites that are not necessarily being viewed and accessed by the target demographic for those ads, yet clients are still paying for these ‘foreign eyeballs’.